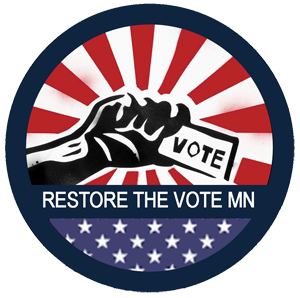 The Restore the Vote Minnesota campaign will be hosting a rally and door knock on Saturday, Sept 20th in Minneapolis and St. Paul to talk with community members about this campaign. Every fall, Americans have the opportunity to exercise one of our must fundamental and sacred rights, the right to vote. This is a right that so many of us hold in high esteem. We proudly display I voted stickers and praise Minnesota’s high voter turnout. However, a day which so many of us look forward to is a day of exclusion and silencing for over 63,000 Minnesotans who have been convicted of a felony. In Minnesota, we disenfranchise over 50,000 of these Minnesotans even after they have left prison or jail and are living in our communities, and a disproportionate number are people of color. The Restore the Vote MN campaign wants to change the law so as soon as someone is released from prison or jail they are eligible to vote. Join the campaign to knock doors in North Minneapolis and on the East side of St. Paul to talk with voters about restoring the vote, ask them to fill out action post cards (which will be sent to their legislators and the Governor), and to register people to vote.